The thing I miss most about Korea, is food. 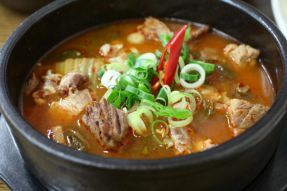 In Korea, the food commonly uses chilli paste or powder and we have primarily spicy dishes. It’s a hot beef soup with a little spice. It’s a great soup for a hangover and we usually eat it to keep warm during the winter. Chicken, marinated in chilli paste is one of the most famous dishes. 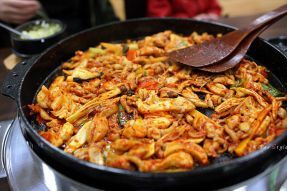 It is most famous in the Chun-cheon area of Korea, and is very popular during the cold winters. This is an example of some classic Korean street food. It is rice cakes marinated in a sticky chilli sauce. Some places make it so smicy it can make your mouth numb! 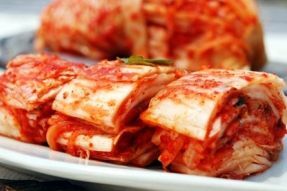 Kimchi is a food on its own, but also an ingredient in some Korean dishes. It is fermented cabbage with chilli pate, anchovy and different spices. It’s a versatile food and goes great with Sam Gyeop Sal (grilled pork belly). 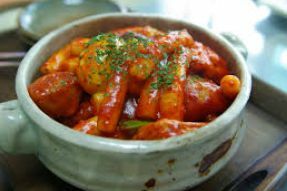 Koreans used to make Kimchi by storing it in a clay pot then bury it underground. But these days, you will find it in a Kimchi refregerator in most people’s homes.